These are out of chronological order – I misplaced the pictures. 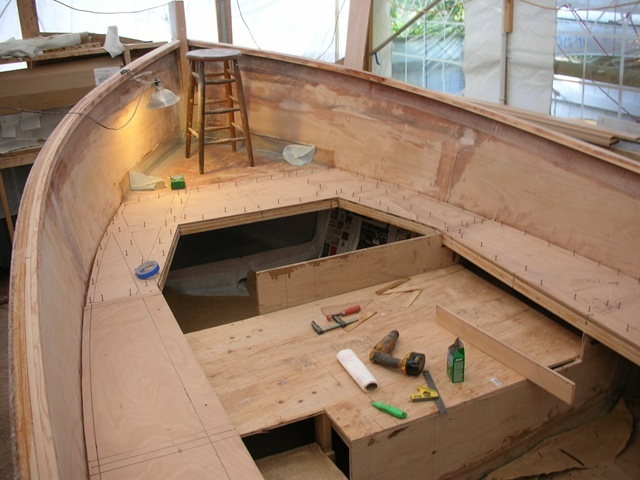 The deck framing is three layers of hemlock 1 x 4’s laminated. The diagonal parts were lapped onto the first layer of the fore-and-aft stringer and glued together so the whole frame is bonded together. It made for lots of small pieces to fit together but it feels very strong. This will be the foundation of the house sides, so I wanted a strong, rigid framework. 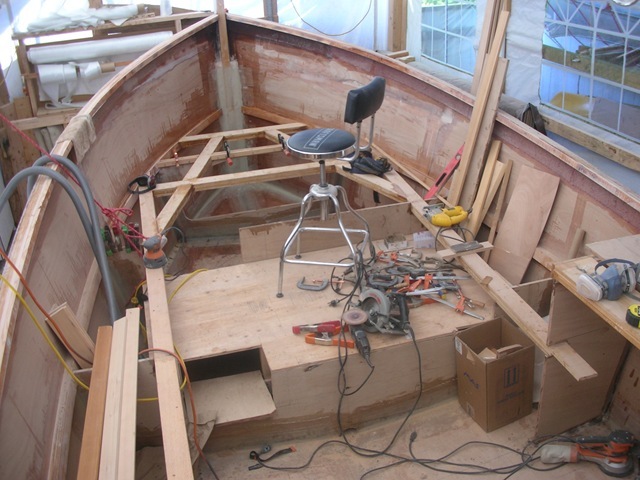 The pilothouse deck that the stool is on is temporary, but at the correct height. 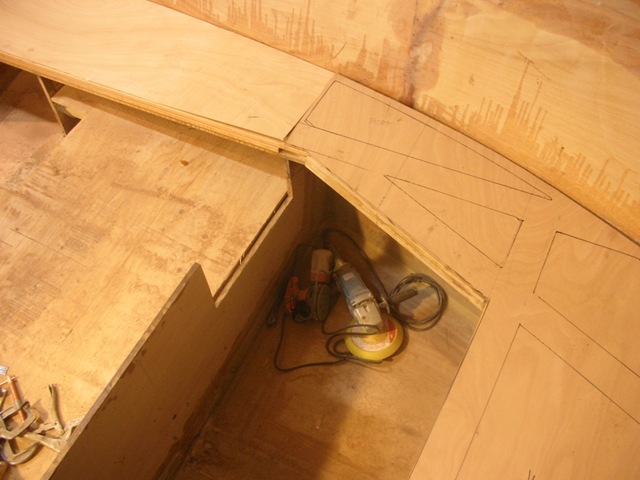 I cut away most of this bulkhead – you can see the cutout in the picture above. 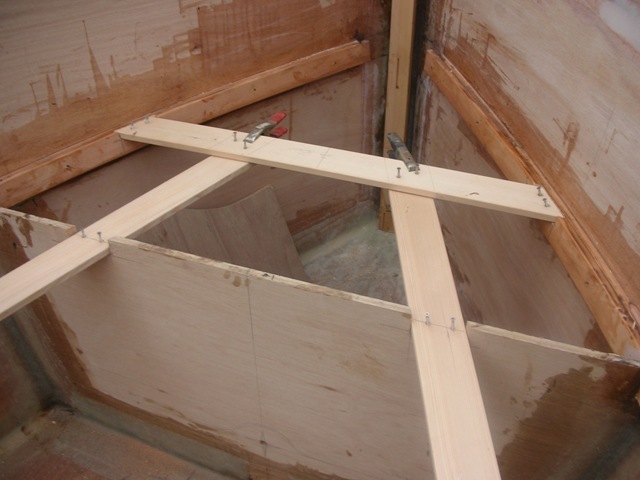 The foot of the pilot bed goes through here to the bow. 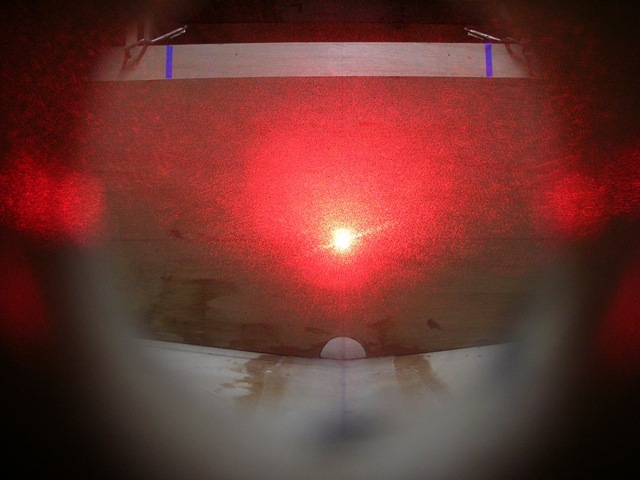 This is just a cool picture of the laser level through the bulkhead WL holes as I leveled the boat. Glassing the bulkheads. 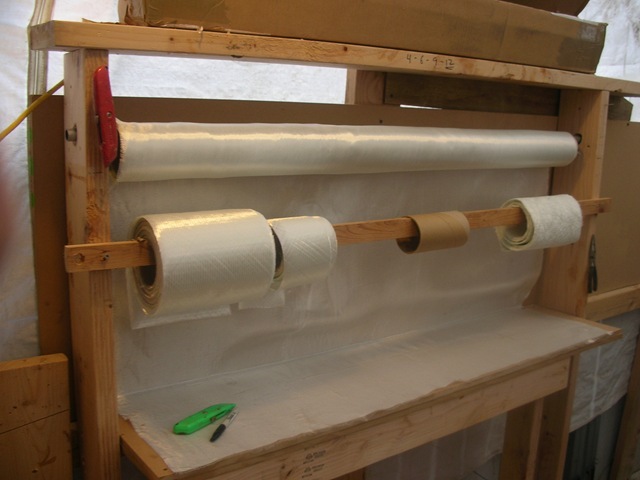 Four layers on each joint – three layers of biax and a layer of tooling cloth for protection. I went to a junkyard auto recycler on Aurora Avenue (Pick-a-Part) and got some nice seats out of an old Honda. 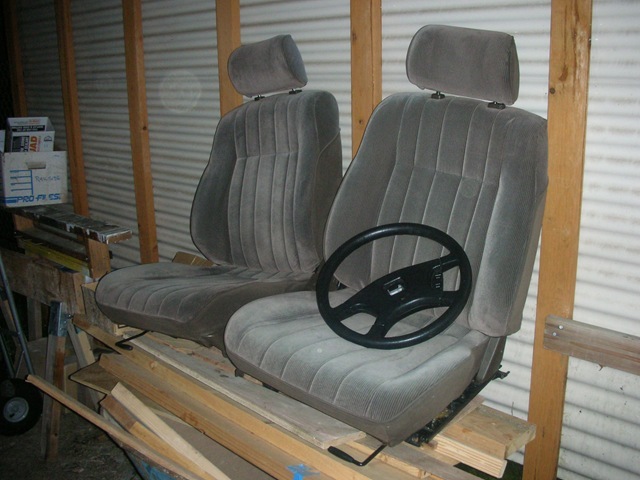 Grabbed the steering wheel too so I can make make a steering-station mockup. Cost an hour of my time and $50.00. I like the idea of reclining seats in the boat. They also adjust 6 inches fore and aft. I’ll see if that’s enough. I’m having a very hard time designing the seating, steering, and instrument placement. I’m going to have to build it all full-size to see what works. 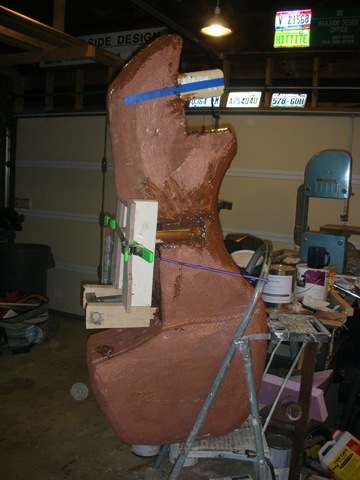 Here are some shots of an outboard motor mockup I made to test the fit of the real motor. 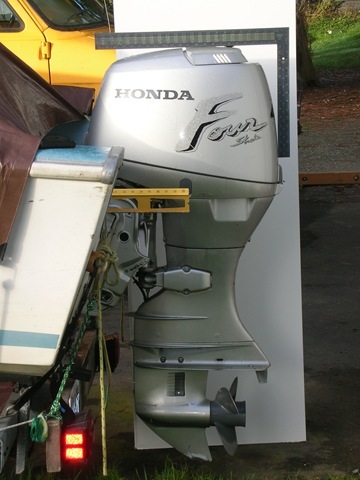 It’s a full-scale copy of the 45 HP Honda on my runabout. First, I took pictures of the real motor with a square for scale, then traced them full-sized on paper using a projector in a conference room at work. I transferred the drawing to some old foundation insulation by poking holes through the drawing with a nail, then cut out the foam with a keyhole saw. 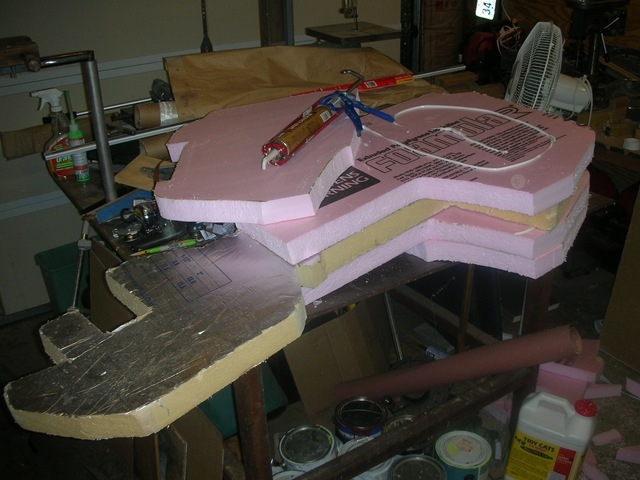 I did this a number of times to build up the thickness, and glued it all together with construction adhesive. I hammered in some steel rod scrap for strength. 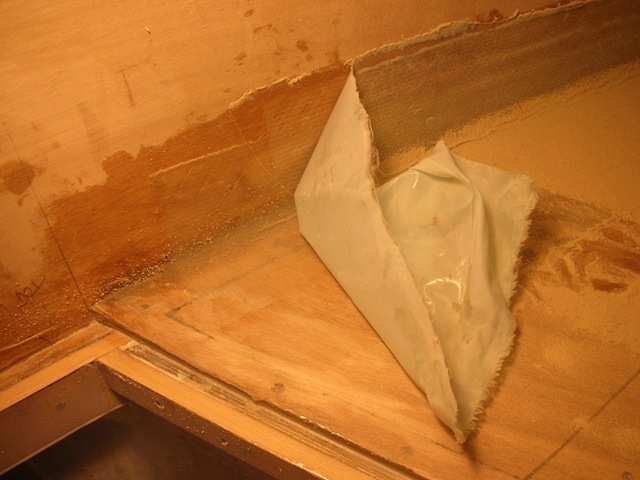 Then I formed it to shape with a Surform and covered it in epoxy. I made a motor mount with about the same dimensions as the real one and welded the parts together to make a mount that lifts and swivels about the same as the real one. 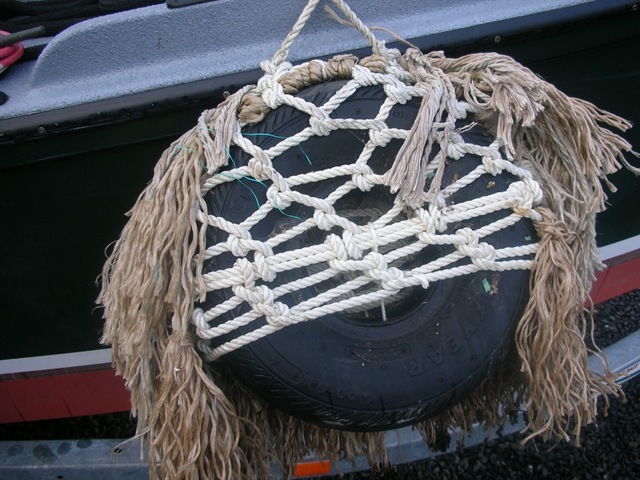 I’m looking forward to seeing it mounted in the boat! Should be somewhat easier to play with than a 300 pound real motor. 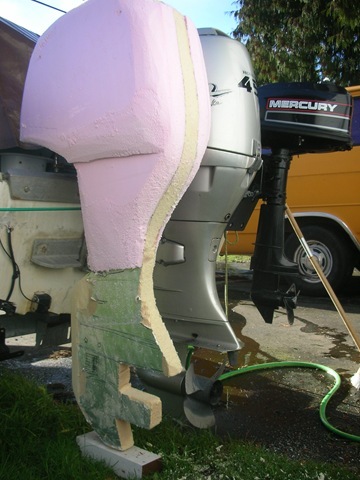 I now know that a 20-inch motor means that the transom height is 20 inches, measured from the top of the mount vertically down to the bottom of the boat. 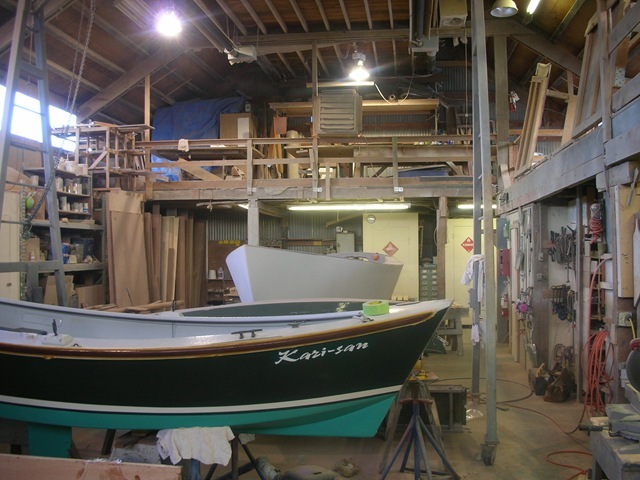 The motor will be in the water deeper or shallower depending on the distance of the waterline to the bottom of the boat. The idea is the anti-cavitation plate should line up with the bottom of the boat to ensure smooth water flow from the hull to the propeller. This is easy to lay out on my boat because the motor well mount is vertical. My motor plans for now are to buy a new Yamaha High Thrust 50 HP motor. The High Thrust motors are designed to move displacement boats at non-planing speeds. They have oversized gearboxes made to run slower than most motors. The propellers are somewhat larger too, helping with slow-speed acceleration and reverse. They’re supposed to be quiet and low-vibration too, which I think is very important. This boat only really needs about 20 HP to push it at hull speed, but I want extra power to drive it safely out of the most adverse conditions. I imagine going through Deception Pass against the tide and a strong wind pushing up the waves. I’m still looking at the equivalent Mercury too – called a BigFoot. They’re both 4-stroke EFI engines with auto-tilt and trim. 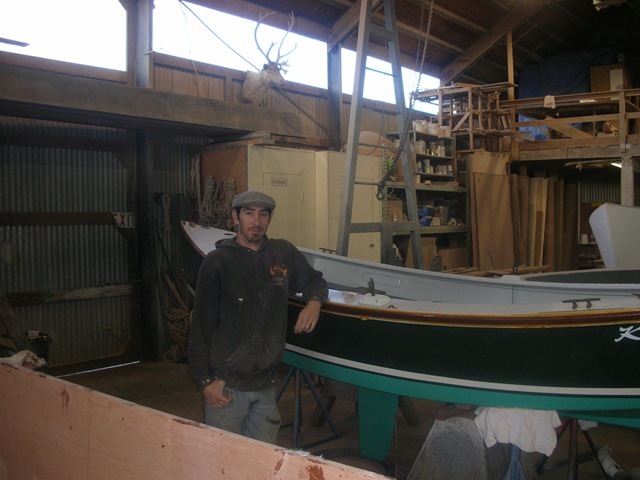 They cost about $6000 new – we’re going to sell the van and runabout to offset some of the cost. 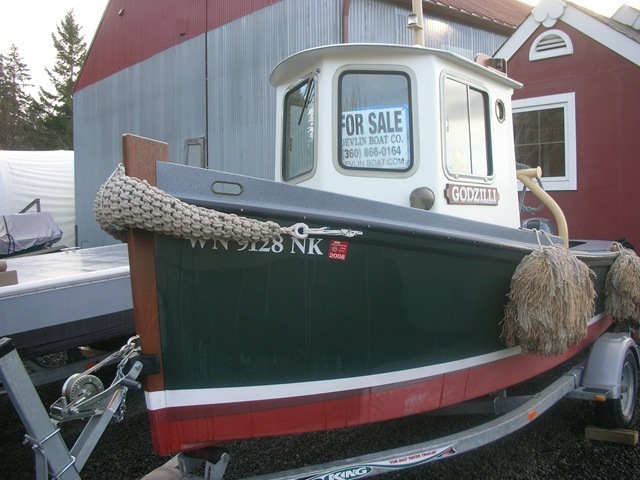 Anyone in the market for a nice van with a queen-size bed or a 16 foot runabout with a Honda? Runs good! 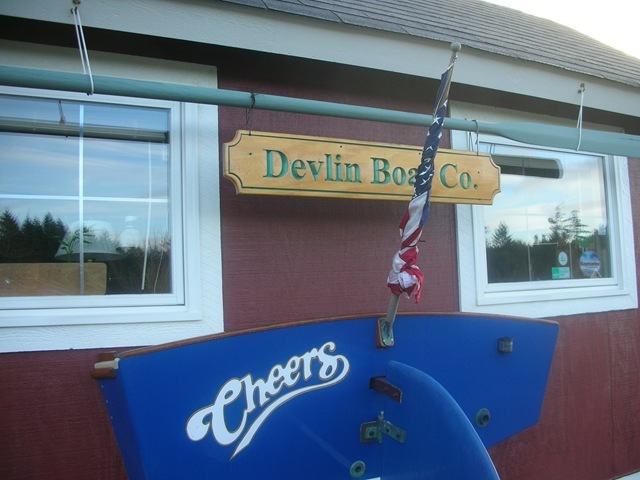 I finally got the bow and side decks installed last week. It took about 200 stainless deck screws, and lots of putty and resin. 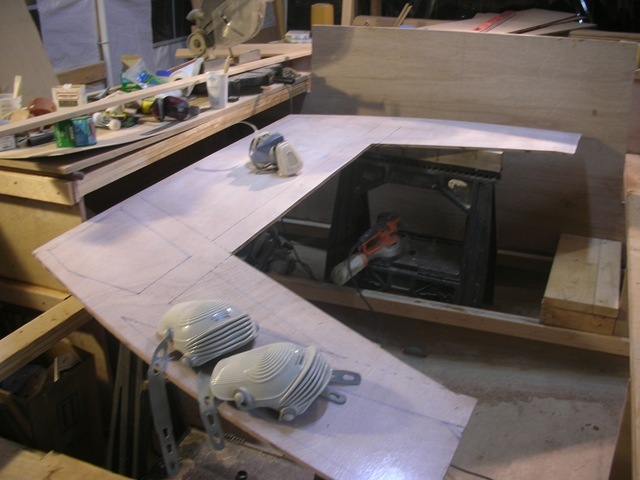 Here are the boards dry-fit in place. 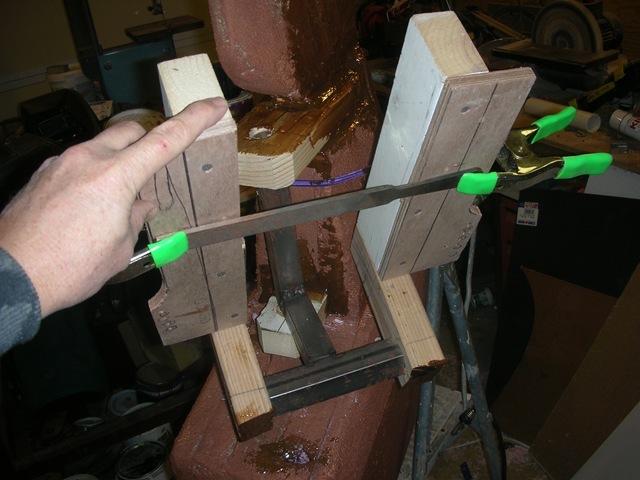 I traced the supports while the panels were upside-down to act as a glue and screw guide. 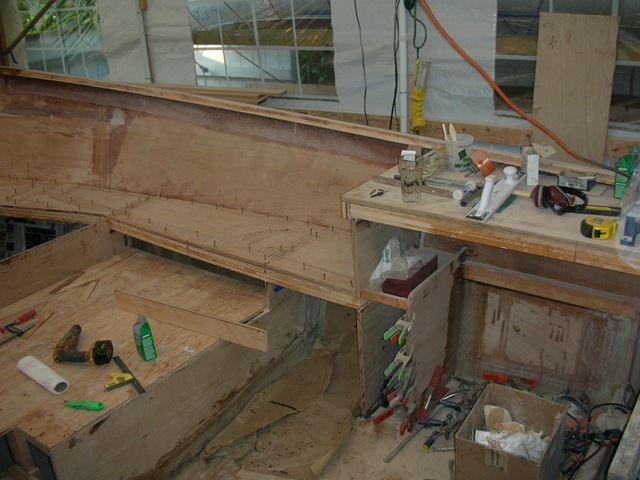 This picture is before sanding off all of the drips from gluing on the stringers when the hull was upside-down. All surfaces exposed to weather will be covered in at least one coat of 6-oz glass cloth. I coated the underside of the boards with white-tinted epoxy, and coated the area below the panels also. I’ll paint the areas later, but this makes it bright enough to work under there in the meantime. Then I pre-drilled lots of screw holes, coated both surfaces with regular epoxy, and slathered on a layer of thickened epoxy as a bedding compound. After screwing down each panel I climbed below and cleaned up the joints with a gloved finger. This helped me tell if I’d used enough bedding on each area. 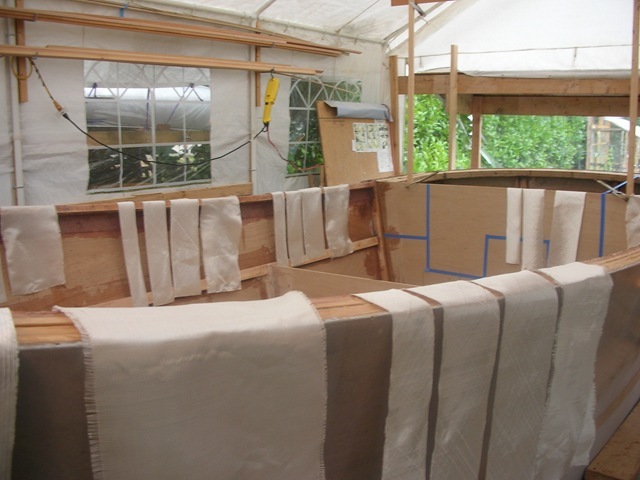 At the bow,I glassed the fillets and covered them with peel-ply so I can cover the hull sides and the deck at the same time later, without a lot of scrubbing and sanding. This is my first attempt at peel-ply, and it seems to work well. I seem to spend as much time washing epoxy as applying it! Here’s the raised deck over the foot of the bed. I made it 6 inches wider than the mattress to make it easier to make the bed. It makes a nice work surface for now. There will need to be a scupper on the lower side deck here, as this will trap water. I think it will be the only visible scupper – all other water will flow to the stern and run out of the motor well scuppers. My next major job is to finish the sheer. I need to sand the tops and insides square, add inside and outside boards, and a 1/2 inch plywood top. Then sand and glass it all. The total width of the rails will be 5 inches, wide enough to step on to get in or to sit on for a while. They also strengthen the whole boat.